Abul Ala Maududi (1903-1979) was an Islamic theologian, a prolific author, and the founder of the political Islamist group Jamaat-e-Islami (JeI). Maududi’s theories helped form the tenets of Qutbism, an ideology that is believed to have influenced numerous violent extremist groups including al-Qaeda and ISIS. Maududi was born in Aurangabad, British India (now Maharashtra, India), in 1903. As a child, he was homeschooled in subjects including the Quran and Hadith, as well as Arabic and Persian. He then studied at the prominent Deobandi school Dar ul-Ulum (also spelled Darul Aloom). At 17 years old, Maududi moved to Delhi and edited two prominent Deobani newspapers, Muslim and al-Jamiyat. He then became the editor and a key writer for the Muslim revivalist journal Tarjuman al-Qur’an.Nikhat Ekbal, Great Muslims of Undivided India (Delhi: Kalpaz Publications: 2009), 141; Haroon K. Ullah, Vying for Allah’s Vote, (Washington D.C.: Georgetown University Press: 2014), 78; Nadeem F. Paracha, “Abul Ala Maududi: An existentialist history,” Dawn (Karachi), January 1, 2015, http://www.dawn.com/news/1154419. Maududi initially expressed admiration for Mahatma Gandhi’s Indian National Congress. In the late 1930s Maududi began to denigrate the Congress for its nationalism, which he saw as the evil responsible for the destruction of the Ottoman Empire. In order to combat such evil, Maududi contended, humanity must live under the sovereignty of God and his laws, or sharia (Islamic law). “Islam is not merely a religious creed or compound…but a comprehensive system which envisages to annihilate all tyrannical and evil systems in the world,” Maududi declared to a crowd at Lahore’s town hall in 1939. 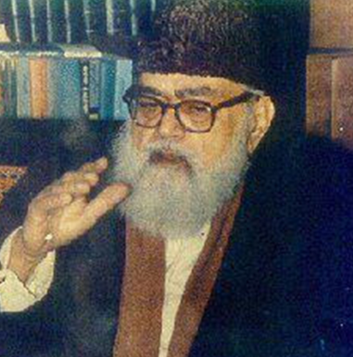 In this speech, titled “Jihad in Islam,” Maududi preached that Islam was a program that sought to “alter the social order of the whole world” and “rebuild it in conformity with its own tenets and ideals.” Jihad, he reasoned, was the “revolutionary struggle and utmost exertion” that would bring about Islam’s revolutionary program.Abul A’la Maududi, “Jihad in Islam,” April 13, 1939, 5, http://muhammadanism.com/Terrorism/jihah_in_islam/jihad_in_islam.pdf; Nadeem F. Paracha, “Abul Ala Maududi: An existentialist history,” Dawn (Karachi), January 1, 2015, http://www.dawn.com/news/1154419. Maududi insisted that sharia would eradicate what he referred to as modern jahiliyya, the state of ignorance afflicting the world’s Muslims. Such modern jahiliyya—in the form of socialism, secularism, or liberal democracy, for example—resembled the ancient variety under which Arabia was ruled prior to the divine message of the Prophet Mohammad. According to Maududi, the only way to defend against jahiliyya was to Islamize society, first by introducing Islamic regulation to politics and economy, and eventually the entire state. Muslim Brotherhood ideologue Sayyid Qutb went on to popularize these notions in the 1960s. Nadeem F. Paracha, “Abul Ala Maududi: An existentialist history,” Dawn (Karachi), January 1, 2015, http://www.dawn.com/news/1154419; Lawrence Wright, The Looming Tower (New York: Random House, 2011), 34-35; Dale C. Eikmeier, “Qutbsim: An Ideology of Islamic-Facism,” 2007, U.S. Army War College, 89, http://www.dtic.mil/dtic/tr/fulltext/u2/a485995.pdf. By the early 1940s, Maududi had declared the All India Muslim League—a political party advocating for a separate Muslim-majority nation state on the subcontinent—to be a “party of pagans” and “nominal Muslims.” A Muslim-majority nation was insufficient in protecting Muslims and eradicating jahiliyya, according to Maududi.Nadeem F. Paracha, “Abul Ala Maududi: An existentialist history,” Dawn (Karachi), January 1, 2015, http://www.dawn.com/news/1154419. In 1941 Maududi founded JeI, hoping to organize a group of pious and learned Muslims that would eventually take total political power. These Muslims, Maududi envisioned, would bring sharia to the Indian subcontinent and erect an Islamic state. Maududi was elected emir of JeI and served in that position until his health declined in 1972.Nikhat Ekbal, Great Muslims of Undivided India (Delhi: Kalpaz Publications: 2009), 141-142; Haroon K. Ullah, Vying for Allah’s Vote (Washington D.C.: Georgetown University Press: 2014), 78-80. After the 1947 partition of the Indian subcontinent, Maududi moved to Pakistan and remodeled JeI as a political opposition party in that country. Pakistani authorities jailed Maududi between 1948 and 1950 for denouncing Pakistan’s operations in Kashmir. He was again imprisoned between 1953 and 1955.Haroon K. Ullah, Vying for Allah’s Vote (Washington D.C.: Georgetown University Press: 2014), 80; “Mawdūdī, Abūʾl-Aʿlā,” Britannica, accessed April 28, 2016, http://www.britannica.com/biography/Abul-Ala-Mawdudi. In 1960, Maududi wrote in his book The Islamic Law & Constitution about his vision of an Islamic state where “no one can regard any field of his affairs as personal and private.” The totalitarianism of God’s sovereignty, Maududi wrote, would “[bear] a resemblance to the Fascist and Communist states.” Scholars have adopted the term Islamic-Fascism, or Islamofascism, to describe Maududi’s and others’ Islamist vision. Retired Colonel Dale C. Eikmeier wrote that Maududi “reminded Muslims that Islam [was] more than a religion; it [was] a complete social system that guide[d] and [controlled] every aspect of life including government.”Sayyid Abul A’La Maududi, The Islamic Law & Constitution (Lahore: Islamic Publications Ltd.: 1960), 146; Dale C. Eikmeier, “Qutbism: An Ideology of Islamic-Fascism,” Parameters: U.S. Army War College Quarterly, Spring 2007, 87, http://www.dtic.mil/dtic/tr/fulltext/u2/a485995.pdf. In 1972, Maududi stepped down from JeI’s leadership due to poor health. In 1979, he moved to the United States and received medical care from his son, a physician. He died in Buffalo, New York, on September 22, 1979.Nikhat Ekbal, Great Muslims of Undivided India (Delhi: Kalpaz Publications: 2009), 142. Abul A’la MaududiSalim Mansur, “Islam and Islamism,” Gatestone Institute, July 23, 2013, http://www.gatestoneinstitute.org/3865/islam-islamism. Sayyid Abul A’La MaududiSayyid Abul A’La Maududi, The Islamic Law & Constitution (Lahore: Islamic Publications Ltd.: 1960). Syed Abul A’ala MaududiHaroon K. Ullah, Vying for Allah’s Vote (Washington D.C.: Georgetown University Press: 2014), 78. Abul Ala Maududi (1903-1979) was an Islamic theologian, a prolific author, and the founder of the political Islamist group Jamaat-e-Islami (JeI). “But jihad in the Way of Allah is a much more comprehensive term than mere fighting in the Way of Allah. Jihad applies to all those efforts that are made to degrade the word of kufr and to exalt the Word of Allah and to establish the Islamic System of life, whether by propagating the Message of Allah in the initial stage or by fighting in the final stage of the struggle.”David Aaron, In Their Own Words: Voices of Jihad (Santa Monica: RAND Corporation, 2008), 58. “Instead of offering apologies on behalf of Islam for the measure that guarantees security of life, property and faith to those who choose to live under its protection [infidels], the Muslims should feel proud of such a humane law as that of jizyah. For it is obvious that the maximum freedom that can be allowed to those who do not adopt the Way of Allah but choose to tread the ways of error is that they should be tolerated to lead the life they like. That is why the Islamic State offers them protection, if they agree to live as its Zimmis by paying jizyah, but it cannot allow that they should remain supreme rulers in any place and establish wrong ways and impose them on others. As this state of things inevitably produces chaos and disorder, it is the duty of the true Muslims to exert their utmost to bring to an end their wicked rule and bring them under a righteous order.”David Aaron, In Their Own Words: Voices of Jihad (Santa Monica: RAND Corporation, 2008), 58. “None of His [God’s] subjects has the right to arrogate to himself the position of a sovereign rule. Nor is any individual or legislative body competent to make laws according to their own whims and caprices and call upon the subjects of God to follow that law instead of the Law of God. Nor does any government have the right to enforce its own authority in disregard of the Devine Authority and require people to obey its own command irrespective of the Divine injunctions. All these are acts of rebellion: false claims to sovereignty and recognition of these claims both amount to manifest rebellion and those who are guilty of either of these offences are bound to be punished sooner or later.”Sayyid Abul A’la Maududi, “The Road to Peace and Salvation,” U.K.I.M. Dawah Center, accessed April 28, 2016, 10, http://www.teachislam.com/dmdocuments/Maulana_Maududi_The_Road_to_Peace_and_Salvation.pdf. “Islamic ‘Jihad’ does not seek to interfere with the faith, ideology, rituals of worship or social customs of the people. It allows them perfect freedom of religious belief and permits them to act according to their creed. However, Islamic ‘Jihad’ does not recognize their right to administer State affairs according to a system which, in the view of Islam, is evil. Furthermore, Islamic ‘Jihad’ also refuses to admit their right to continue with such practices under an Islamic government which fatally affect the public interest from the viewpoint of Islam.”David Aaron, In Their Own Words: Voices of Jihad (Santa Monica: RAND Corporation, 2008), 57-58. “In reality Islam is a militant ideology and programme which seeks to alter the social order of the whole world and rebuild it in conformity with its own tenets and ideals. ‘Muslim’ is the title of that International Militant Party organized by Islam to carry into effect its militant programme. And ‘Jihad’ refers to that militant struggle and utmost exertion which the Islamic Party brings into play to achieve this objective.”Abul A’la Maududi, “Jihad in Islam,” April 13, 1939, 5, http://muhammadanism.com/Terrorism/jihah_in_islam/jihad_in_islam.pdf. “Islam wishes to destroy all States and Governments anywhere on the face of the earth which are opposed to the ideology and programme of Islam regardless of the country or the Nation which rules it…It must be evident to you from this discussion that the objective of Islamic ‘Jihad’ is to eliminate the rule of an un-Islamic system and establish in its stead an Islamic system to State rule. Islam does not intend to confine this revolution to a single State or a few countries; the aim of Islam is to bring about a universal revolution.”Abul A’la Maududi, “Jihad in Islam,” April 13, 1939, 5, http://muhammadanism.com/Terrorism/jihah_in_islam/jihad_in_islam.pdf. “Islam is not merely a religious creed or compound name for a few forms of worship, but a comprehensive system which envisages to annihilate all tyrannical and evil systems in the world and enforces its own programme of reform which it deems best for the well-being of mankind. Islam addresses its call for effecting this programme of destruction and reconstruction, revolution and reform not just to one nation or a group of people, but to all humanity.”Abul A’la Maududi, “Jihad in Islam,” April 13, 1939, 16, http://muhammadanism.com/Terrorism/jihah_in_islam/jihad_in_islam.pdf.